One of our Common Councillors, Hatfield House resident Sue Pearson, blew her top not long ago at a City Corporation planning meeting, accusing the assembled decision-makers of “trashing our wonderful estate”. 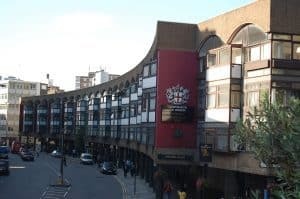 Two weeks later, it might have looked like she had egg on her face when the same planning committee granted conservation area status to both the Barbican and Golden Lane Estates. But as residents will tell you quickly, words mean little if not followed by deeds. 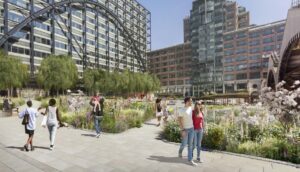 Councillor Pearson is not alone in her dim view of council attitudes towards our estate. Many residents complain not just of the material neglect shown to what is studied worldwide as important modernist architecture, but of the institutional failure to genuinely attach any cultural value to these boxy coloured buildings we call home. 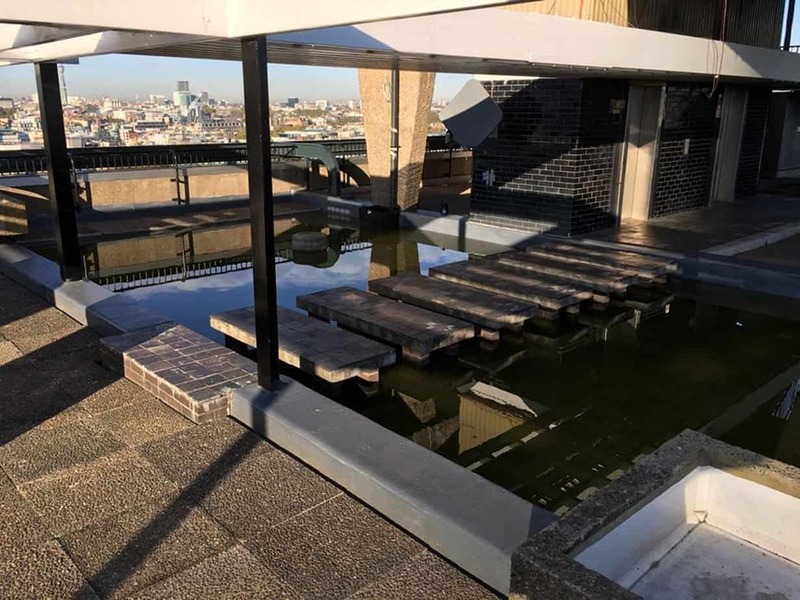 It was Councillor Pearson who one warm day in 2016 invited me to join a party of volunteers 16 storeys up on the top of Great Arthur House, where there is, unbeknownst to many residents, a spectacular roof garden – with pond. The garden has been closed for many years, yet it is one of the most beautiful and distinguished parts of our estate, and remains criminally ignored and under used. 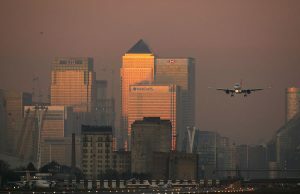 We had a job to do on that day because parts of the garden’s paving had become overgrown with weeds, so we set about our back-breaking work with little to sustain us other than the fabulous views of London in every direction. We finished with aching arms but the smug feeling of a job well done. So I have some sympathy with Councillor Pearson’s sentiments about our landlords. Residents would just like to get a sense that the City Corporation views its asset, our estate, with some pride. It could all be so different. In Barcelona, one of master architect Gaudí’s most celebrated buildings, Casa Milà (aka, La Pedrera), has a roof garden that has been properly secured and is scrupulously maintained, hosting regular summer evenings of light music. Back on Golden Lane, a more enlightened approach can be seen unfolding behind the community centre. On her arrival as estate manager back in April, Michelle Warman took an instant shine to our fish pond, which sits in a peaceful sunken garden between Bowater House and Bayer House. The pond had fallen into a sorry state, but now it is a picture of nascent vitality. Fresh reed beds have been planted and a new aerating pump has replaced the old ugly one. The fish can once again breathe easily, free from choking slime. Their only problem is a hungry heron that has been spotted lurking on the roof of Bayer House, eyeing a feast below. 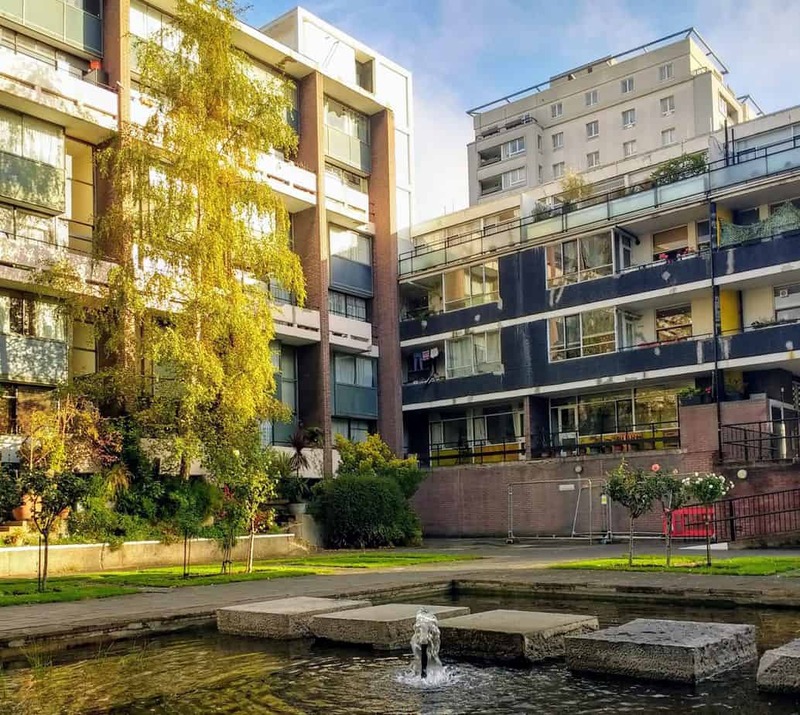 It is some of the lesser used areas of the estate, such as Great Arthur roof garden, the fish pond, the lawns and the open spaces that make Golden Lane so admired. But they’re also often the parts that come under the threat of development. That’s when Councillor Pearson is likely to launch into another “trashing” fit. Another example is the recent City Corporation decision to close the estate’s management office and use the space to create new flats. Where the estate office will be relocated is a mystery. The City Corporation says it can move into the community centre, but nearly four months after the community centre officially opened after refurbishment, it is still not fit for wheelchair users. It’s hard to argue against the creation of much-needed new homes, but in this case I’ll give it a go. When the estate was first built, its administrative hub was deliberately put in a central, open and accessible place on the ground floor of Great Arthur House. The present office fronts on to a paved plaza connecting it to the community centre. This plaza is where residents gather, bump into one another, swapping stories and information about activities and events. This space has been converted into a busy car park, and nattering residents are forced to step aside whenever a vehicle approaches. Robbing the estate of its communal spaces is the kind of casual and careless “trashing” that Councillor Pearson is trying to resist. Not long ago, she had a bad accident and simultaneously broke both of her arms. Yet still she soldiers on, often in the face of ugly opposition. So when I say “more power to her elbow”, I mean it in more ways than one. Last month I wrote about the dangers of U-turning traffic to residents crossing Fann Street. In two half-hour vigils, I counted 26 and 29 (almost one a minute) prohibited U-turns. Under the Freedom of Information Act, I asked how many penalties had been issued in the past year, the amount of the fine, and where the money is spent. The reply has just arrived, stating that 266 penalty notices went out in the past 12 months (fewer than one a day), that the fine for each is £130, discounted to £65 if paid within 14 days, and that the money is spent on off-street parking and other transport projects.